Sep. 28, 2018Guillaume wasn’t crazy about Birkenstocks. It’s not that there was anything wrong with them as a shoe, they just weren’t his cup of tea stylistically. So when the adventurer and outdoor enthusiast started combing the internet for a shoe with the same innovative focus on sustainability but with a different look and functionality for adventure, he came up empty. Nobody had done this yet, nothing existed. There was no skate shoe that was eco-friendly, and there was no eco-friendly shoe that matched the cool urban aesthetic he wanted and was springy enough to move the way he wanted to move. With his experience in working with adventuring brands like REI, Guillaume got to work, bootstrapping a small project that would take an environmentally detrimental industry into an entirely new style category. Your average shoe has been around the block long before it hits the pavement. From production to store shelves, one pair of running shoes has produced 30 lbs of carbon emissions — it’s like leaving the bathroom light on all week. Multiply that times the 25 billion pairs that are produced each year, and you have an annual footprint estimated to be at 750 billion pounds of carbon released into the atmosphere every year. It’s not just production and air quality that takes a hit either. Most shoes are made with polyurethane foams and plastics, materials that are derived almost in their entirety from petroleum. These materials take centuries to biodegrade (it’s estimated that some may never break down), and require all sorts of flame retardant chemicals to be safe to wear. The fast fashion industry has been finding itself becoming more and more accountable when it comes to the environmental consequences of their production and product life cycles, but shoes still have some catching up to do. 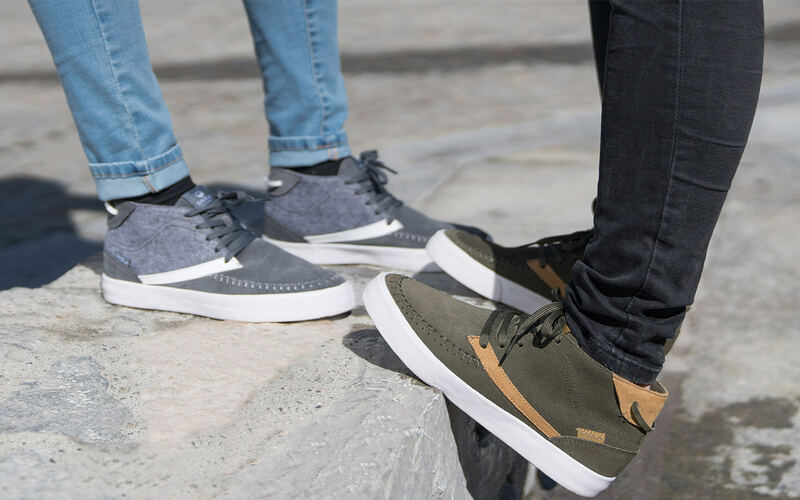 When Guillaume and his team started developing Saola Shoes, they struggled at first to find a material for the soles that was bouncy and responsive like polyurethane foam, but more eco-friendly. Rubber was too heavy and bulky, but they were able to find a solution with an advanced new material called BLOOM Foam. Made from algae scum that encroaches and takes over freshwater ecosystems, BLOOM Foam eliminates petroleum from part of the shoe equation, and gives movers and shakers the lightweight shoes they need to stay agile on the pavement. Kicking polyester fabrics to the curb, Saola Shoes uses an innovative new fabric made from recycled plastic bottles. It’s a one-two environmental punch, reducing the plastic bottle footprint in landfills, and cutting petroleum from the shoe production process again. We talk a lot about the importance of organic cotton as a more sustainable fabric around here, and for good reason. Conventionally farmed cotton is thirsty, and can literally dry up seas in a matter of months with the irrigation it demands from local water sources. It’s sensitive, it’s delicate, and it consumes a whopping 30% of the world’s pesticides. Even laces help, which is why Saola Shoes only uses organic cotton in theirs. Organic cotton uses 50% less water, is grown in rotational farmland to give the earth a chance to bounce back, and keeps farmers and families from being exposed to toxic insecticides. Saola Shoes was cool enough to send me a pair of these kicks to try for myself, and by “me”, I mean my husband — a stay at home dad, who was once upon a time a skateboarder and bass player, and desperately misses the necessity of a good pair of skate shoes. Saola, you made his month. The first thing my husband noticed about these things was how lightweight they were — it was almost bizarre. When you’re used to running around with rubber soles, Saola Shoes come as something of a shock. The cork and Bloom Foam soles are every bit as thick as a conventional pair, but very noticeably lighter. The fit of the toe area was a bit trim for my husband, but with a little wearing them around the house, he soon got them to a state that was more comfortable for him. They fit a little snug from the top down — it’s not that they’re narrow. I chalked this up to a performance fit, one that didn’t your toes room to roam and fidget while you were on the board. He’s since grown super fond of them. They’re comfortable, they look great, and we still can’t believe they’re made of algae. Whether you’re skating or just taking tiny humans to preschool every day, they look great, and they hold up to daily wear incredibly well. Sustainability isn’t a state of being, it’s a journey, and Saola Shoes is really big on that. “We’re not here to preach to people or make them feel bad about their choices. We figure it all starts with one thing, and for us, it was our shoes,” says Guillaume. What’s your favorite stylish eco-friendly brand? Show us on Facebook or Instagram and tag us in the post! @AvocadoMattress.